Alexandra Garbarini received her B.A. from Williams College in 1994 and completed her doctorate in 2003 in the department of history at University of California at Los Angeles, writing a dissertation under the supervision of Saul Friedländer. 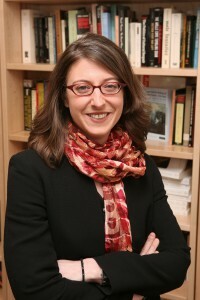 Her first book, Numbered Days: Diary Writing and the Holocaust (Yale University Press, 2006) was a runner-up for the National Jewish Book Award, Holocaust category, and is the first sustained analysis by a historian of the significant ways in which European Jewish wartime diaries contribute to our understanding of the Holocaust. Drawing on an array of unpublished and published diaries from all over German-occupied Europe, Garbarini analyzes the role of diary writing within ordinary men and women’s larger struggles to cope with the unimaginable genocide as it unfolded around them. She is currently at work on a study of interwar European cultural and legal responses to mass atrocity and political violence, and their legacy for post-World War II international law and the concept of human rights. Since the spring of 2003 she has taught at Williams College, where she offers courses on the history of the Holocaust, European Jewish history, and modern European cultural and political history. Jewish Responses to Persecution, vol. 2, 1938-1940. With Emil Kerenji, Jan Lambertz, Avinoam Patt. Lanham, MD: Altamira Press, in association with the United States Holocaust Memorial Museum, 2011. “Reflections on the Holocaust and Jewish History,” part of the forum on David Engel’s Historians of the Jews and the Holocaust in Jewish Quarterly Review 102, no. 1 (Winter 2012): 81-90. “A Tale of Two Diarists: A Comparative Examination of Experiences in Eastern and Western Europe,” in the occasional paper Ghettos 1939-1945: New Research and Perspectives on Definition, Daily Life, and Survival, United States Holocaust Museum, Center for Advanced Holocaust Studies (2005).